The Big Dig may finally be over, but this ice cream lives on. I take my first bites and there is tons of caramel flavor, and there's a little kick to it. Not like a burn kick, but a flavor kick. I'm seeing lots of brownie chunks at the top. I cheat and put two on my spoon. Hmmm. Not the most mind blowing of things but not bad. Not super flavorful or gooey, but respectable. 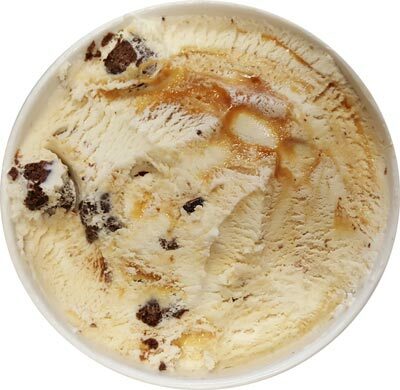 Random question: do you prefer a caramel flavored base or a vanilla base with a ton of caramel swirl? I'm going to say the latter if only for the visual amusement. There is plenty of sweetness to the swirl which I think is part of the kick I was referring too. It's definitely candy like which is always a #funfactor to me. The chocolate chips taste like the chocolate frosting they put on Boston cream pie. That is a bonus right there as it's a flavorful, sweet chocolate that is oh so familiar. My only complaint here is that I wish there were more of them. In case you couldn't tell, I'm definitely enjoying this one. I like things with lots of flavor. It doesn't have to be super premium to be enjoyable, just get the flavors right. Man, why did I wait so long to try this? I've literally stared at it for years now only to realize now how tasty it is. I needed a sweet snack to break up my afternoon and this was it. Lots of caramel flavor, nice overall sweetness, getting bits of of brownie here and then (when I'm not hitting a big brownie chunk). It's not some high end base but everything comes together really well. Alrighty, am I the only New Englander who waited way too long to try this one? 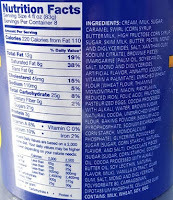 On Second Scoop: Mmmm, nice flavorful after snack yet again. The texture isn't perfect but I don't care, it clicks and that's what matters. I prefer a vanilla base with tons of swirls as well. That's why I'm such a huge TH fan - damn tasty swirls get me every time! 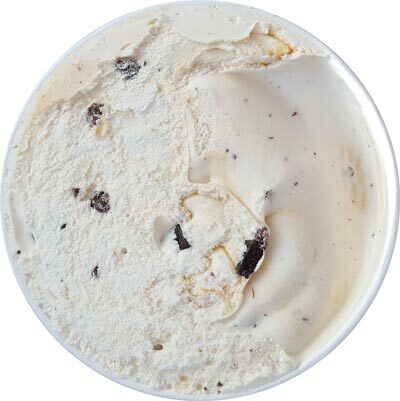 I haven't had this flavor in years as I always go for chocolate chip when I eat Brighams...it is so good because I love the vanilla and the little chips. But I do remember this flavor being quite good, despite my not being a caramel lover. 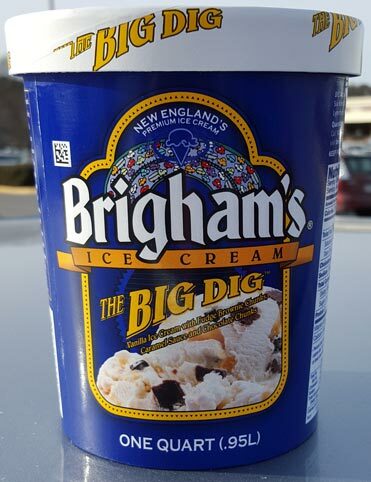 Brighams us definitely underrated, although I know it is a small company, only in MA. I think its on par with Yeungling and other slightly less premium than Ben and Jerrys and a little above the (old) Friendly's and Edys. I prefer a caramel base with a caramel swirl, only because caramel is generally sweeter than vanilla and I love things sickeningly sweet! Probably why Haagan Daz's sea salt caramel gelato will always be one of my favorites xD I wish I could find this brand in Maryland, I'd try it in a heartbeat! If you're looking for a new "idea" since you're unable to find new products to review, I'd love to see a side by side taste off between magnum and haagen daz bars! 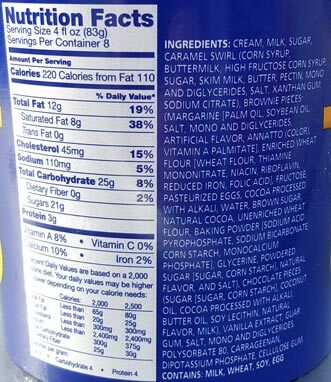 @Deb: I think if they cleaned up the ingredient list a little and gave us some new stuff, they could do alright. @Morgan: it would go something like "wow, these are both really good"
I don't even want new stuff...I just like the chocolate chip! I a, not one of those that thinks that more "stuff" is always better. Especially when it takes away from the quality of the ice cream. That is my problem with Ben and jerrys. I love the base consistency and flavor but not all the nuts, cookies (with the exception of cookie dough which is incredible) and cake bits. I'll go with the architect miss van de Roeh' "less is more"
But seriously, I would love to see hard numbers of what really sells and what doesn't, i need to befriend an ice cream manager somewhere. Target is supposed to have the new Ben & Jerry's Cake My Day. I went to Target last week, & the old exclusive flavor was still stocked. @Anon: I'm waiting as well, just takes time to cycle through the system unfortunately. @Deb: Ha, I wouldnt aim that high, B&J are busy guys! We often use shorthand for a few companies, TH is turkey hill, B&J is probably obvious, HD is haagen-daz, GF is gelato fiasco. I think that's it.